And there’s ice on the lake. For more hope, please visit: Camera Critters. I’m fighting a heavy cold so please excuse me if I don’t get round to visiting you. Posted in Camera Critters, dogsTagged flowers, golden retriever, pets, signs of spring, snowdropsBookmark the permalink. Wonderful to find those first little nodding heads pushing their way up through the undergrowth …. searching for the light. Well done Oscar! HHHMMMmmm… maybe I should ‘borrow’ Oscar to help me find autumn downunder?!?! Oscar certainly found at least a little Spring. I hope your cold gets better soon – they make a person feel vile, out of all proportion to the severity of the illness don’t they. Off topic. If you ever have any contact with Marie, can you tell her that I have been thinking of her and LG and hoping that things in their world are going well? I was just thinking of Marie and writing to her. I’ll pass on your message. beautiful way of capturing the l’ll signs of spring:) hope your cold gets better soon…. Sorry you are fighting that cold. Get well soon!! Oscar looks like a great companion. Cold cure : hug a warm dog. Oscar must know where to look for Spring. Pretty shots. Have a happy week! 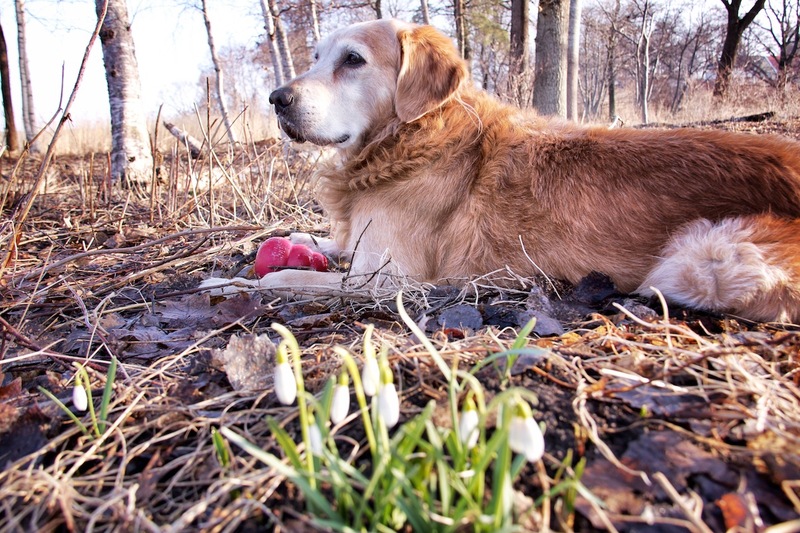 That first photo of dog and spring is priceless. He knows what is important and glad he is leading you around! Oscar is the perfect guide! A glimpse of spring is surely better than none at all! Sorry about your cold — never a fun time, hope you are feeling better soon. Thank you for your kind words about Sam, they’re greatly appreciated. he’s just the most wonderful of companions! and models! Your snow really left quickly didn’t it? Even if there is still ice on the lake, the ground is giving up winter. Oscar is adorable. I marvel at your terrific photos. I send greetings and kisses. And it is the little signs that really bring hope!!! Take care of yourself, and see you when you are better!!! Oh, I do LOVE that sweet little nose! First one perfection -the moment captured, Oscar the purveyor of hope -definitely worth a GRUNT of monumental proportions. Hope Spring rushes in, always a good remedy for the cold. 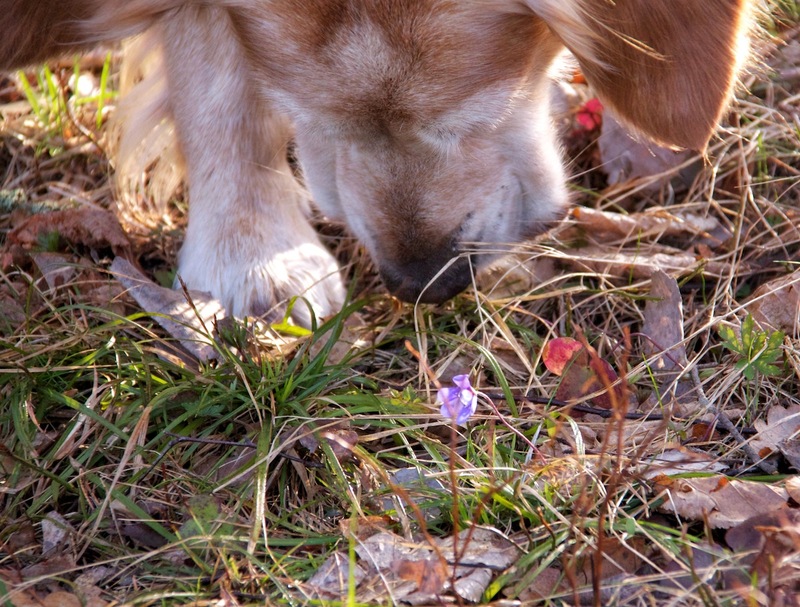 That’s such a cute shot of the dog sniffing the flower! Welcoming spring with a cold… take care. Oscar is adorable, and I love those signs of spring. It feels like spring here today but we should get more snow this week. Get better soon. Spring will be coming. Looks like he made some nice finds. I saw butterflies yesterday so I think it’s finally spring. Well, Oscar looks ready for another season of swimming soon. Love the Snowdrops Fiona. Aren’t they the cutest. They should last for a while considering the cool temps. I’m glad Oscar took you for a walk and found some signs of spring! Feel better soon. Spring this year has certainly been start and stop, but the blooms have started and for the first time it really feels real. Good boy Oscar! Love the snowdrops! Yes, that beautiful Oscar, and smells of spring awakening! Oscar is such a darling one! Oscar has such a majestic presence! He makes the world less tentative! Gorgeous photos! It looks like Oscar has keen eyes and ears to spot the signs of spring. I love the doggy nose in the first photo! ooops! I meant he has a keen “smell” instead of keen “ears”. Oscar stops to smell the flowers! You found quite a lot of them, too! I hope you are feeling better. I’m glad Oscar took you for this walk. Both of these photos of Oscar are marvelous. Oscar is such a beauty! And a clever dog, he found spring!